He was seen helping transport the second nurse to Emory. The man seen not wearing a hazmat suit while standing just feet away from the second nurse with Ebola as she was transported to Emory University hospital did not need to wear the protective gear, the medical airline said. The nurse, identified Wednesday as Amber Vinson, was flown from Dallas to Atlanta on medical airline Phoenix Air. She was seen being transported to and from the ambulance by three people in full-body hazmat suits, but the fourth person by her stretcher was wearing plainclothes and holding a clipboard. The airline confirmed to ABC News that the man was their medical protocol supervisor who was purposefully not wearing protective gear. 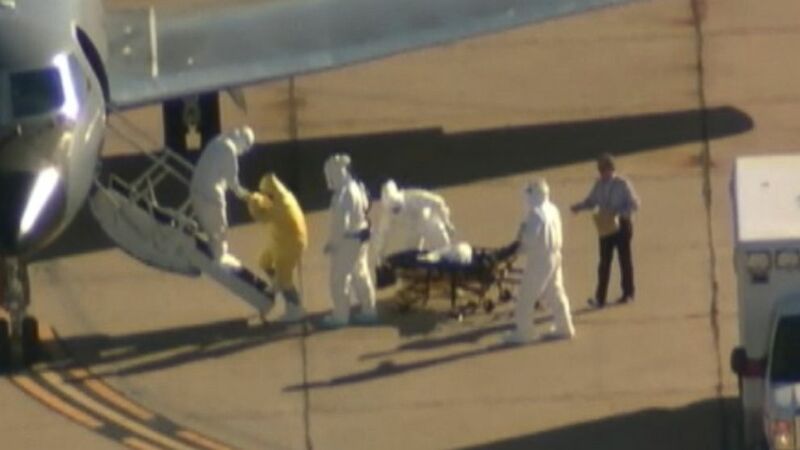 "Our medical professionals in the biohazard suits have limited vision and mobility and it is the protocol supervisor’s job to watch each person carefully and give them verbal directions to ensure no close contact protocols are violated," a spokesperson from Phoenix Air told ABC News. "There is absolutely no problem with this and in fact ensures an even higher level of safety for all involved," the spokesperson said. (KDFW) A man without a hazmat suit assists in the transportation of Ebola patient Amber Vinson from an ambulance to a plane at the Dallas airport on Oct 15, 2014.